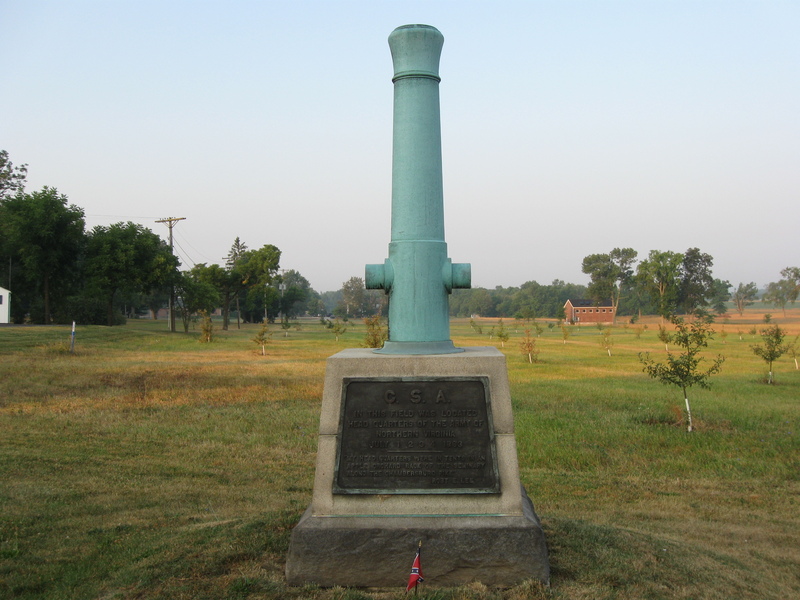 Erected in the early 1900s, this marker denotes the apple orchard behind it as the headquarters of Robert E. Lee during the battle of Gettysburg. This view was taken facing southwest at approximately 6:40 AM on Tuesday, July 6, 2010. 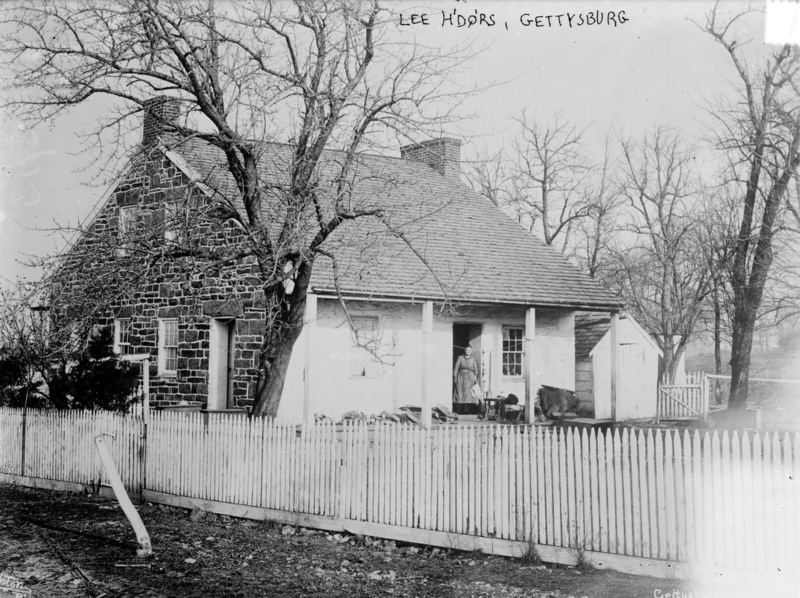 In the decades following the Battle of Gettysburg, it was accepted in a number of accounts that the Thompson house was the location of Lee’s headquarters. It wasn’t until 30 years after Mary Thompson’s death (she died of tuberculosis on May 25, 1873) that accounts can be found that seemed determined to discredit the Thompson house as being Lee’s headquarters, or as having anything to do with the famous general at all. In 1896 the Thompson house caught fire, and though the stone structure held, the inside was destroyed. During the critical years in the early 1900s when the War Department was buying land, the Thompson house was never purchased. 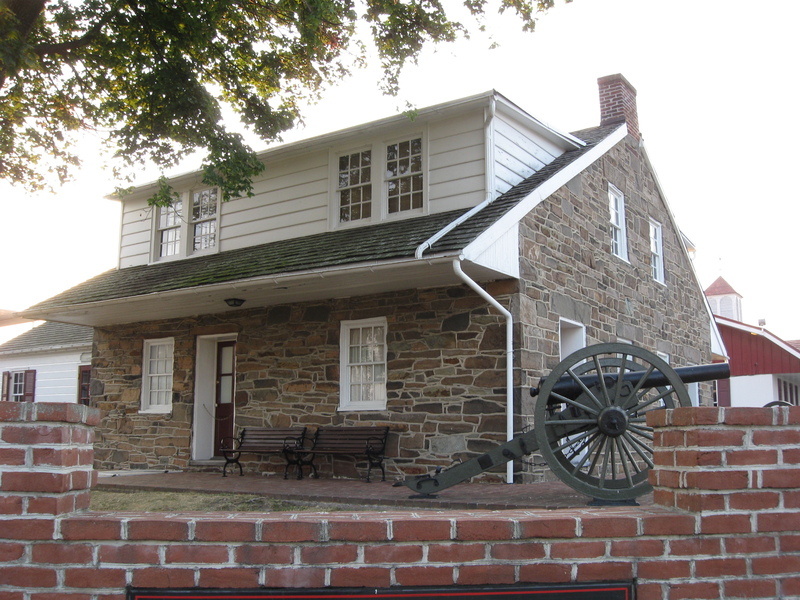 Articles appeared claiming that Lee did not make his headquarters in the house, with some going so far as to suggest that Lee was never in the house at all. This view was taken facing northeast at approximately 6:40 AM on Tuesday, July 6, 2010. 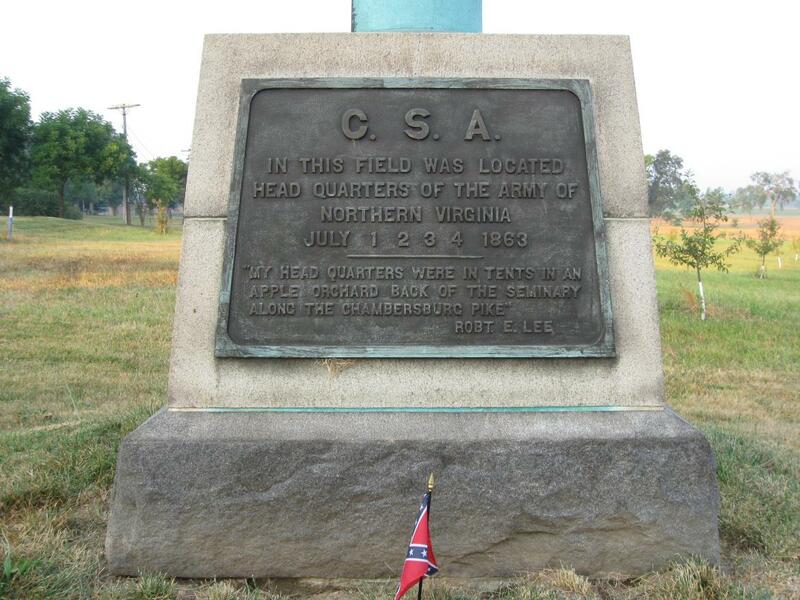 Erected by the Gettysburg National Park Commission, the following quote is found on the marker: “‘My head quarters were in tents in an apple orchard back of the seminary along the Chambersburg Pike.’ ROBT E. LEE.” Interestingly, this quote cannot be attributed directly to Lee. It appears in a 1907 article, which claims that the quote came from a friend of the author, who in speaking with famous Gettysburg historian John Bachelder, was told this quote was given by Lee in an interview. There is no evidence other than this 1907 article to suggest that such an interview took place between Bachelder and Lee, yet the quote survives on the marker to this day. This view was taken facing southwest at approximately 6:40 AM on Tuesday, July 6, 2010. What is clear though, from both primary and the numerous secondary accounts, is that Lee did spend time in the Thompson house, and his staff did have headquarters tents in the apple orchard. 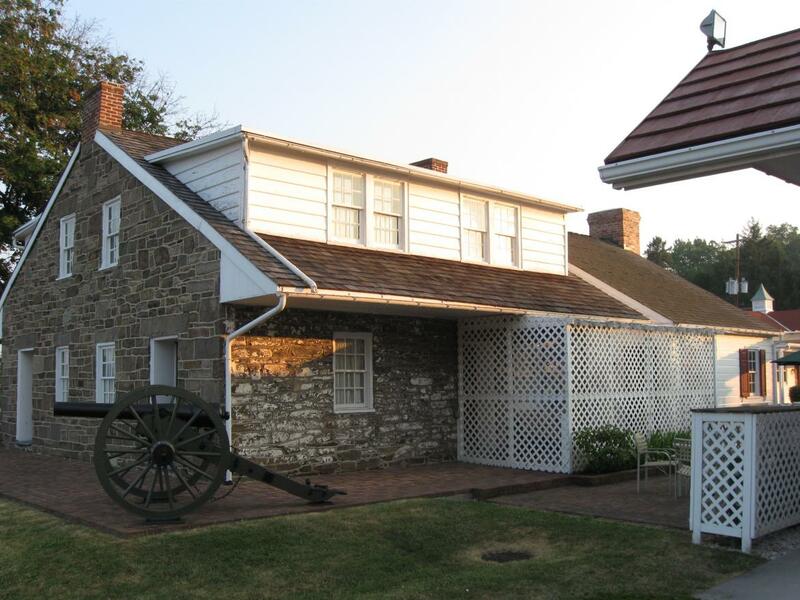 Regrettably, this movement to discredit the Thompson house in the early 20th century, for whatever reason, may have prevented it from being secured and protected by its inclusion into the National Park. 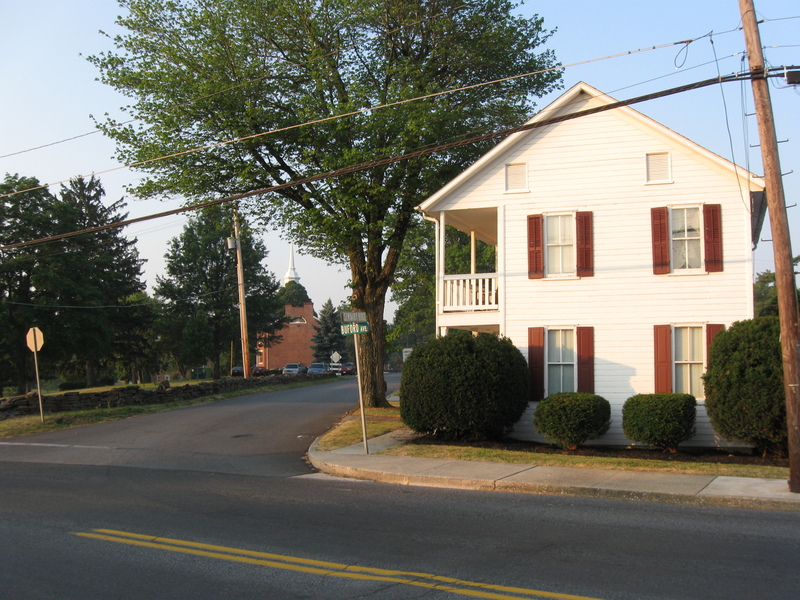 The dormers that changed the one and half story house to a two story house were added sometime after the fire of 1896. This view was taken facing northwest at approximately 6:40 AM on Tuesday, July 6, 2010. Taken by William Tipton, the LOC page for this photo puts its date as 1913, though this is questionable. The identity of the woman standing in the doorway is unknown. This view was taken facing northwest circa the 1900s, and from the lack of leaves on the trees, likely during winter. Of course Lee spent most of his time during the battle out on the battlefield. Across the road from the Thompson house was the home of her oldest son, James Henry Thompson. 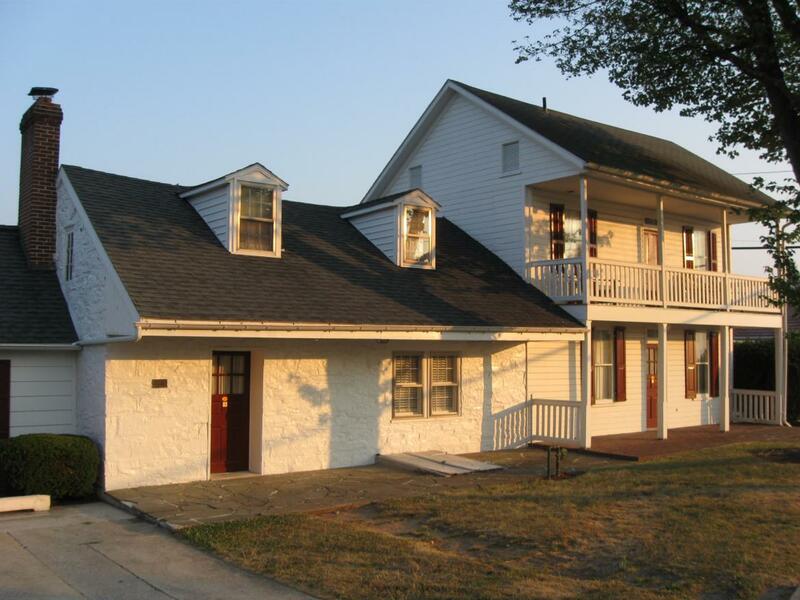 The building in this view is a modern addition to the 1863 structure, which we will show you after we cross the Chambersburg Road. This view was taken facing south at approximately 6:40 AM on Tuesday, July 6, 2010. The James Thompson house. The structures to the right and left of the original center structure are modern additions. This view was taken facing west at approximately 6:40 AM on Tuesday, July 6, 2010. 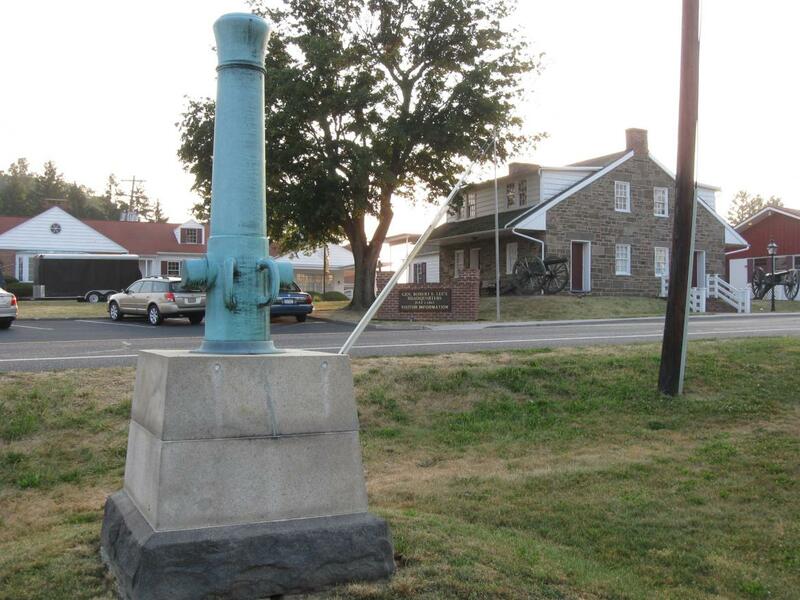 Just across the road, and just opposite the James Thompson house, is the location of one of the Civil War’s most famous photographs. The grass sloping down the ridge is owned by the Lutheran Theological Seminary. 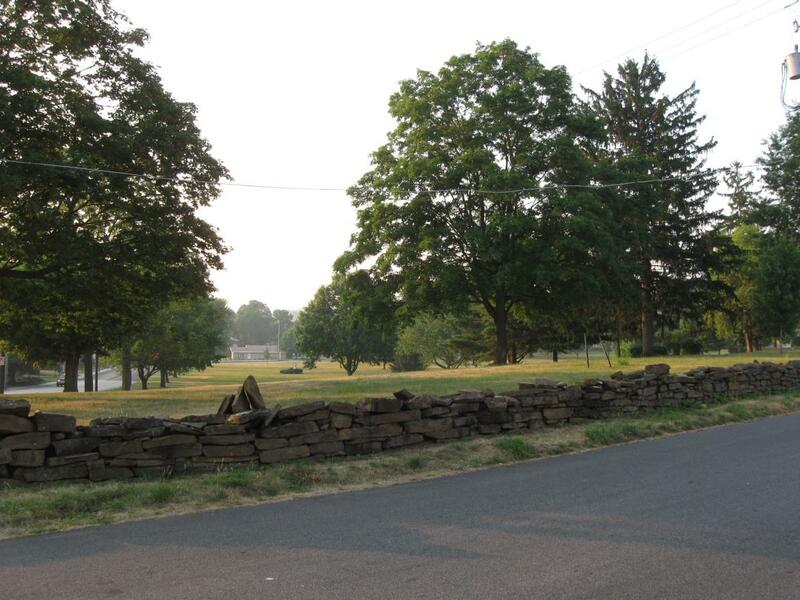 The rock wall was constructed to represent the fortifications erected here by the Confederate army on the evening of July 3rd, after evacuating the town of Gettysburg and preparing for a Union counterattack. This view was taken facing southeast at approximately 6:40 AM on Tuesday, July 6, 2010. 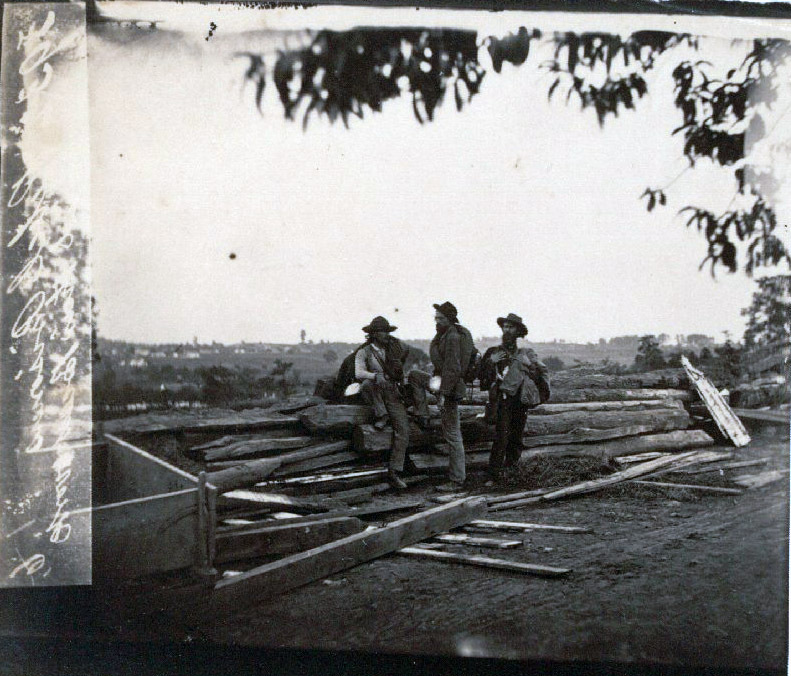 The Brady photograph taken here, often titled “Three Rebel Prisoners at Gettysburg,” was likely shot on July 15, 1863. 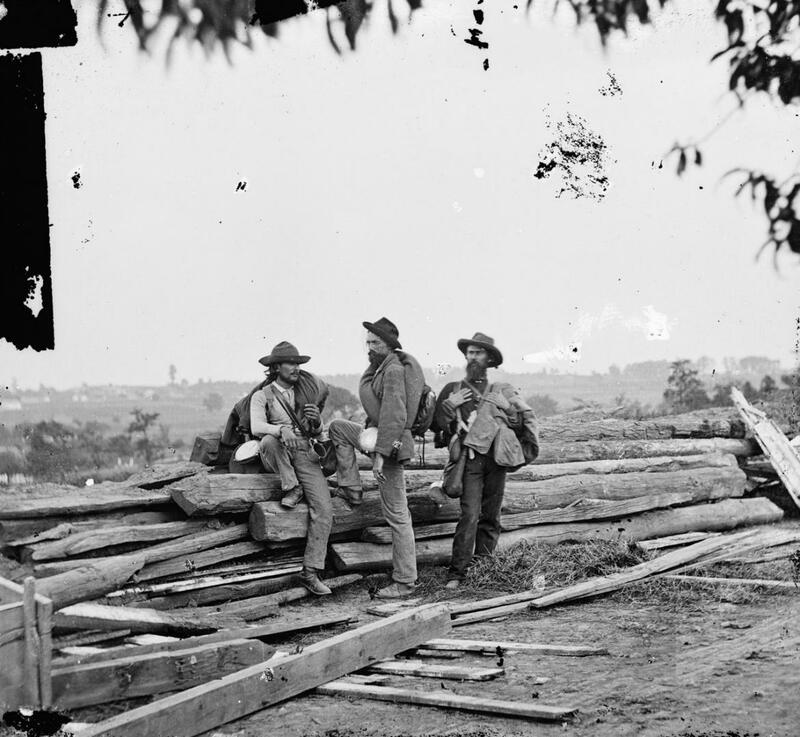 It is speculated that because the Army of Northern Virginia left Gettysburg on July 4, that these men were deserters who were picked up outside of town. We have stitched together the left and right portions of this stereograph (LOC page here) in order to provide the complete view of these two Library of Congress stereo halves. This view was taken facing southeast on or around July 15, 1863. … However, the negatives in the possession of the Library of Congress are not the originals. They were likely copy negatives, made in 1865 for publication. This print, likely a contact print from the original negative, shows that the stereographs Brady and his crew took were a bit larger than was previously believed. This view was taken facing southeast on or around July 15, 1863. This full stereo view is contained in the collection of the Gilder-Lehrman Institute of American History. This view was taken facing southeast on or around July 15, 1863. It is safe to say that Robert E. Lee spent time in this house in July of 1863, and that it was certainly part of the ground he referred to as his headquarters. This view was taken facing northeast at approximately 6:40 AM on Tuesday, July 6, 2010.